Izzy’s determined to escape her troubled past with a new start by the sea – but flirtatious Charlie Jones is causing complications. Alicia’s been happily married to loyal Hugh for years but secretly craves excitement. Maybe it’s time to spice things up? Emma’s relationship with David was once fun and romantic but trying for a baby has taken its toll. Then temptation comes along . . . As the future of the family’s B&B becomes uncertain, Izzy, Alicia and Emma are thrown together unexpectedly. It seems that keeping up with the Joneses is harder than anyone thought . . . There are a select few authors whose books I wait impatiently and eagerly to be released each year and Lucy Diamond is one of those authors. I am sure most of you have a few fail safe authors who you know what ever book you pick up by them is sure to be pure escapism, well this author is well and truly on that list for me! You can always tell a Lucy Diamond book from way off as she has her own signature look when it comes to her books they are always bright and cheerful and Me and Mr Jones is as bright as they come. 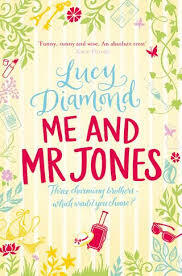 Me and Mr Jones follows Emma, Alicia and Izzy all who are the love interest of the Jones brothers. The story alternates between each of the women's perspectives, allowing us to really get to know each of the characters in turn as well as their partners and the dreaded mother in-law! Things have become to much for parents Lilian and Eddie and the time has come for them to leave the family home and b&b business but they really want to keep it in the family but which one of their three sons will be ready to take charge? I loved each and everyone of the characters in this book even down to Lilian who appears to be the mother in-law from hell! Quite often when there are a large amount of characters in a book it can often get a little confusing as to who is who but this was not the case in this book all of the characters were developed so well they were all quite clear to tell apart. I loved the relationships but I did enjoy Izzy and Charlies relationship best as there was more excitement and mystery as to will they wont they which kept me gripped. What I have always loved about Lucy Diamonds books is her writing style, she always manages to make her story lines flow so effortlessly through out the entire book that you cant help devour her books in one sitting. The author has created a storyline which is believable and interesting so it held my interest from start to finish. I maybe being very hopeful here but I do feel as though there could be a possibility of a sequel to this book and I for one would be first in line to pick up my copy and re-visit these characters to see how all there lives have changed. This is a delightful, warm read that centers around family and relationships making an ideal summer read with a perfect setting in the beautiful Lyme Regis.